Next Stop, East Coast Championships! We are so excited to announce that we are USA Rugby DII Midwest Conference Champions! We are now looking forward to the Spring season where we will continue our road to Nationals. Our fundraising efforts help offset the costs of traveling much further than we have to in our regular season, in the hopes that we will bring home a national title! To kick ???? things off we will be selling Superbowl squares. Once a sheet is filled we will open up another, and so on. Our goal currently is to fill up 2 sheets – a total of 200 squares! Each sheet represents a prize pool of $1200. Entry fee is $20. 1st & 3rd quarter: $150 prize each. Halftime: $300 prize. Final: $500 prize. The four squares that touch* the final score will also be paid out $25. *Please note this means squares to the top, bottom, left, and right. Not diagonal. 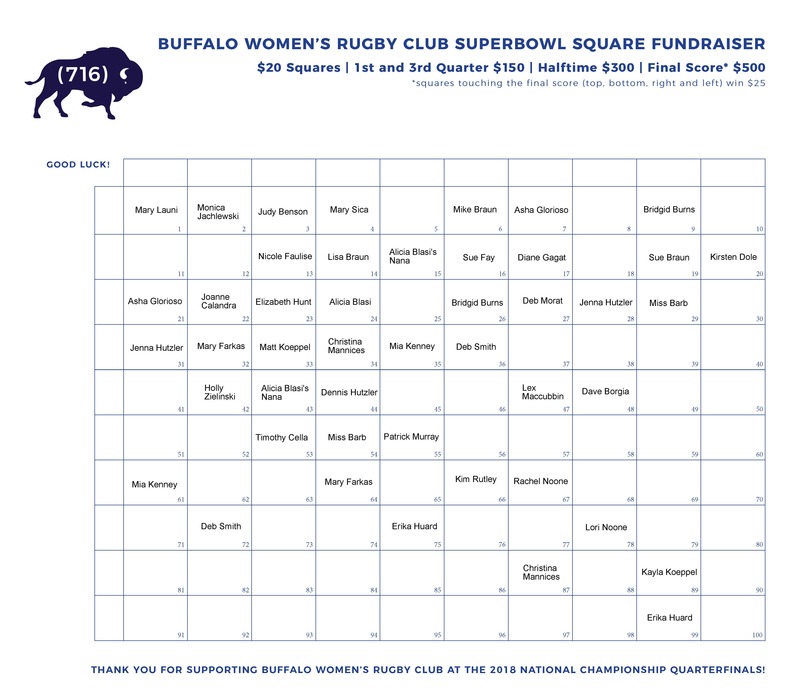 Please Venmo @buffalowomensrugbyclub your $20 entry fee and in the comments tell us what square you would like. If you don’t include a square number, one will be chosen for you. If you do not wish for this info to be publicly displayed on Venmo be sure to adjust the visibility of the payment to private. If you do not have Venmo, please feel free to message us or get in contact with a member of the team so that we can get you squared (see what we did there?) away! We thank you for your endless support! The things we have accomplished this year wouldn’t have been possible without it!! !